Summary : A good training ride with minimum stops over a variety of terrain. Some on-road experience necessary. Suitability This ride would suit a rider wanting to do longer distances than Easy grade rides, with some moderate hills or a more experienced rider wanting a good training ride. Must be experienced riding on road in traffic. 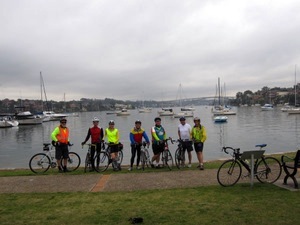 Features Hills down from Epping to Gladesville Bridge, then back up at the end, with mostly flat riding around the foreshore of Parramatta River, with scenic river views. This ride starts at Epping and makes it way, mostly along back roads, down to the Parramatta River, crossing over the Gladesville Bridge. It then is mostly on cycle paths, while wending its way back along the foreshore of the Parramatta River with a coffee stop in Concord. We than continue along the river to Meadowbank. From there it is uphill and on roads again back to Epping. With a start at either 8 or 9 (depending on the season), we should expect to be home for lunch.